Curved gaming monitor can give us an immersive gaming experience. Thanks to their particular form, we will be ” catapulted ” directly into the action. The constant struggle between flat monitors and curved monitors has been going on for a long time. There are those who prefer monitors with normal displays, while others decide to opt for a curved and more immersive solution. In this guide, we will see how to choose the perfect curved gaming monitor and, which are the best models currently on the market. The monitor is undoubtedly one of the fundamental components of our location. Obviously, it is advisable to buy a monitor that lasts over the years, so you do not have to replace it in a short time. Before moving on to the purchase of the product, we have to evaluate some characteristics and some aspects, which are crucial in our decision. It is essential to choose the display size according to our needs. However, it is advisable to buy a monitor with a display above 22″, as we will be able to fully enjoy the details offered by the game. Not always ” higher resolution ” is equivalent to saying, ” higher quality “. It is important to analyze the display resolution, also taking into account the monitor screen size. Obviously, it is not recommended to buy a 24″ monitor with 4K resolution, as we will not be able to fully enjoy the details offered by this resolution. Or it makes no sense to buy a 27” monitor with Full HD resolution, as the details will be undefined. In addition, we must also consider the performance of our GPU, or the video card, which deals with the graphic rendering. So to enjoy 4K resolution, we will have a GPU powerful enough to support it. These are two characteristics that must be carefully analyzed. The refresh rate is the refresh rate of the display, which is the number of times in a second in which the image is redrawn on the monitor display. This parameter is measured in Hz and is taken into account with the pixel response, ie the response time. Usually a good monitor, both for gaming and graphics, has a response time of 1 ms.
For a curved gaming monitor, it has become essential to have a refresh rate above 60 Hz. After analyzing all the fundamental features, we can move on to choosing our new monitor. In this price range, we find monitors with good features, with Full HD display and refresh rate of 60 Hz. It is a perfect monitor for those approaching the world of curved monitors for the first time. This model of Samsung is equipped with an excellent quality/price ratio. It features a 24″ display with Full HD resolution, ie 1,920 × 1,080 pixels, with a refresh rate of 60Hz and a response time of 4 ms. The real highlight of this monitor is the very competitive price. There is also a 27″ version, but we do not recommend buying it as it is equipped with Full HD resolution. In this section, we find mid-range products, with better features than previous models. We find monitors with Full HD resolution and higher refresh rate than previous products. This is a monitor with a 24″ display with Full HD resolution (1,920 × 1,080 pixels), with a refresh rate of 144 Hz and a response time of 1 ms. These features make it an excellent product related to gaming. The display offers a contrast of 3000:1, ensuring excellent image quality and deep blacks. This is a very good 27″ monitor made by MSI. It is equipped with a GHD resolution, ie 1,980 × 1,080 pixels, a refresh rate of 144 Hz and a response time of 1 ms. The panel is of the TN type, perfect for use in the videogame field. The only flaw is the resolution a bit low compared to the size of the display. It is a very good product, which guarantees us an excellent quality at a low price. This section contains the best curved gaming monitors currently on the market. The proposed models offer maximum performance for an immersive and unparalleled gaming experience. It is a monitor of Acer, belonging to the Predator series, dedicated to gaming. It is equipped with a 34″ IPS display in ultrawide 21: 9 format, with a QHD resolution of 3,440 × 1,440 pixels. Furthermore, the refresh rate is 100 Hz, with a response time of 4 ms. Acer’s monitor is equipped with NVIDIA’s proprietary G-Sync technology, which allows us to eliminate screen tearing and any kind of disturbance. Acer’s EyeProtect technology allows us not to strain your eyesight during intensive gaming sessions. It also comes with two DTS Sound 7W integrated speakers. We come now to the real protagonist of this guide, the Asus ROG SWIFT. It is a curved gaming monitor that guarantees maximum performance. It features a 34″ display in 21: 9 format, with UWQHD resolution, or 3,440 × 1,440 pixels. Unfortunately, it does not have a TN panel, but an excellent IPS panel has been adopted. The refresh rate is 100 Hz, with a response time of 5 ms. It is obviously equipped with the famous NVIDIA G-Sync technology, which increases the display efficiency. It is also characterized by various technologies such as Ultra-Low Blue Light, Flicker-Free, GamePlus and GameVisual, to guarantee the videogame an unprecedented image quality and comfort. We also find an efficient ventilation system, thanks to which any overheating of the device will be avoided. In this, lists are the 10 most sold monitors on Amazon. The list is constantly updated by Amazon itself. 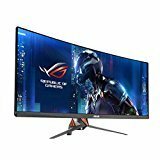 3 ASUS ROG Strix 27” Curved Gaming Monitor Full HD 1080p 144Hz DP HDMI DVI Fully Adjustable Function... 197 Reviews from $399.90 See Offers! 4 Sceptre C248B-144R 24-Inch Curved 144Hz Gaming Monitor AMD FreeSyncTM HDMI DisplayPort DVI, Metal... 186 Reviews $179.99 See Offers! 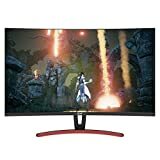 5 LG 34UC79G-B 34-Inch 21:9 Curved UltraWide IPS Gaming Monitor with 144Hz Refresh Rate 383 Reviews $596.99 $542.90 See Offers! 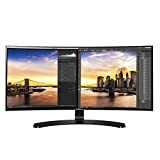 7 LG 34UC80-B 34-Inch 21:9 Curved UltraWide QHD IPS Monitor with USB Quick Charge 310 Reviews $549.99 See Offers! 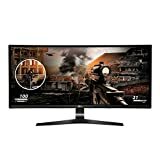 8 Samsung IT LC24F390FHNXZA 24-Inch Curved Gaming Monitor (Super Slim Design), 60Hz Refresh Rate w/... 466 Reviews $179.99 from $173.70 See Offers! 9 Acer ED323QUR Abidpx 31.5" WQHD (2560 x 1440) Curved 1800R VA Gaming Monitor with AMD Radeon... 275 Reviews $399.99 $334.80 See Offers! 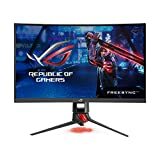 10 MSI Full HD FreeSync Gaming Monitor 24" Curved Non-Glare 1ms LED Wide Screen 1920 x 1080 144Hz... 627 Reviews from $238.29 See Offers!